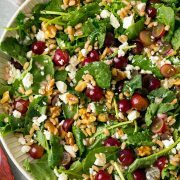 Add this to your collection of farro recipes! 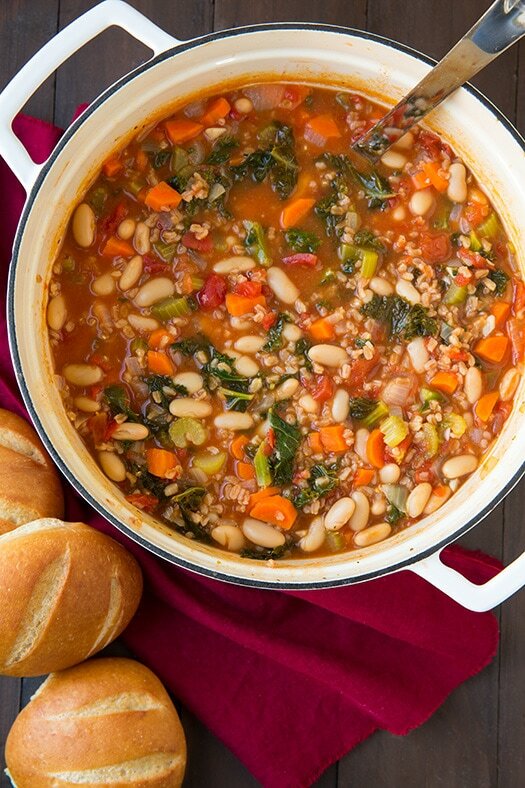 This Mediterranean Kale Cannellini and Farro Stew is such a hearty, healthy dinner! It’s packed with veggies and it’s a good source of protein. It makes a delicious dinner plus it reheats well for lunch the next day. One ingredients I’m trying to cook more with is farro. And this is the perfect recipe for it! The farro makes it filling and adds a nice chew. 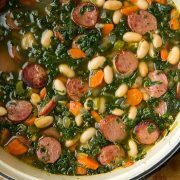 This stew has such a bright fresh flavor that’s melded together perfectly after it’s simmered for 30 minutes. 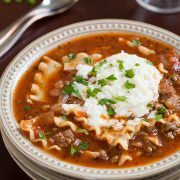 I also love that it’s a healthy soup even my husband and kids enjoy. My 5 year old even said it was one of her favorite soups and asked for more. All around win! Farro is a healthy, ancient whole grain and part of the wheat family (similar to barely and whole wheat). It’s packed with fiber (5 grams per 1/4 cup serving) protein (6 grams per serving) , vitamins (b3), minerals (magnesium, zinc, iron) and antioxidants. It has a delicious nutty flavor and unique, chewy texture. To me the texture is similar to a short grain brown rice. 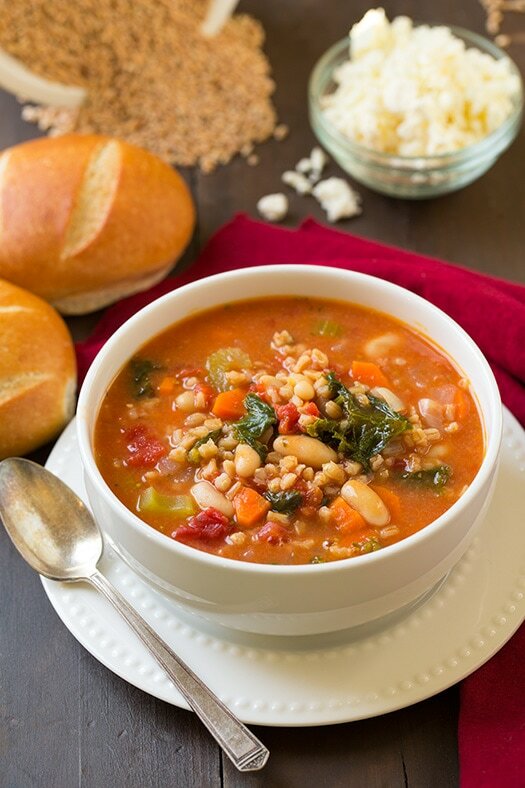 This farro filled stew is such a hearty, healthy recipe! It's packed with veggies and it's a good source of protein. It makes a delicious dinner plus it reheats well for lunch the next day. Add carrots, onion and celery and saute 3 minutes. Add garlic and saute 30 seconds longer. Stir in vegetable broth, tomatoes, farro, oregano, bay leaf and season with salt to taste. Add parsley in a mound to soup and bring soup to a boil. Reduce heat just below medium. Cover and simmer 20 minutes. Then remove parsley, stir in kale and cook 10 - 15 minutes longer until both farro and kale are tender. Adding in cannellini beans and heat through, about 1 minute. 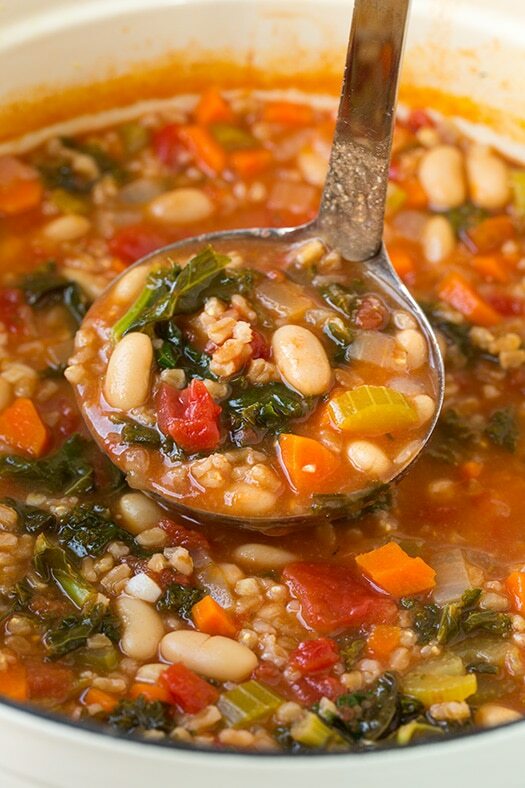 Remove bay leaf, stir in lemon juice and add additional vegetable broth or some water to thin soup as desired (the farro will absorb more liquid as the soup rests). Serve warm topping each serving with feta cheese.